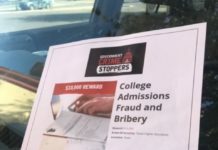 HOUSTON — In the wake of Houston Community College trustees announcing they will vote Thursday on censuring trustee Christopher Oliver after his guilty plea to a bribery charge, the bribery scheme has bled into Mayor Sylvester Turner’s administration. Karun Sreerama, a local business icon who was recently appointed Houston’s director of public works, allegedly made more than $77,000 in unlawful payments to Oliver, according to interviews and federal court records. He was placed on leave with pay today, with Turner saying he wanted to review the matter. Oliver was arrested in March on bribery and extortion charges and he pleaded guilty to the count of bribery in May. Oliver took $90,000 in bribes as an HCC trustee, with some of that coming in the form of VISA gift cards, according to court records. In the count that Oliver pleaded guilty to, prosecutors allege he accepted $12,000 in bribes. Federal courts unsealed those records Friday. Sreerama’s appointment to lead the city’s public works department was announced mid-March and he began the job April 3. City Hall, HCC trustees, and the politically connected began buzzing about Sreerama when court records named someone with the initials K.C. as an extortion victim of Oliver. Sreerama walked in many governmental circles and was deft at closing deals. His company was ESPA Inc., an engineering firm that scooped up many government contracts, getting business from entities such as the Harris County Toll Road Authority, the Texas Department of Transportation, the Houston Independent School District, and the city of Houston. Sreerama attorney Chip Lewis described his client as a victim and said he was frustrated at the news that Sreerama was placed on leave — particularly since Sreerama helped federal law enforcement in the case against Oliver. “I have a problem with someone who’s been a victim, they’ve assisted their federal government in a criminal investigation, and it’s being held against him,” Lewis told The Texas Monitor. Lewis outlined how Oliver approached Sreerama seeking money, which took place during the course of three meetings. At the first meeting, Oliver allegedly told Sreerama he was going through a divorce and needed money. Sreerama allegedly loaned Oliver thousands of dollars after that meeting. It was never paid back. At a second meeting, Oliver said he was adopting a child and needed to have a particular balance in his bank accounts. Sreerama again gave Oliver thousands of dollars, according to Lewis. The third time, Sreerama agreed to hire Oliver’s construction clean-up company to sweep a strip mall for Sreerama, Lewis said. HCC Trustee Robert Glaser posted media reports on Facebook detailing Oliver’s guilty plea. Dozens from the Houston community, including some public officials, have weighed in. HCC Trustee Zeph Capo quipped on Glaser’s post about Oliver’s role as audit chair. “Well, that’s about to change,” Capo wrote. Trustee Board Chair Eva Loredo said in a Friday interview with The Texas Monitor that she was “shocked” at the allegations against Oliver and his guilty plea. Soon after, she released a statement to the public. While HCC trustees will vote Thursday to censure Oliver, they have no power to remove him. Oliver faces ten years in prison and a possible $250,000 fine. ABC13’s Ted Oberg Investigates, which published the initial interview with Lewis. And you expect the same from any conservative area and mayor. Big city Liberal politicians. What else would you expect? Let’s see if they get prosecuted or a Hillary Clinton slap on the hand. Nothing but a bunch of thieves. A typical Liberal in government office. Lining his pockets with taxpayer money. It maybe interesting to see how much much in the Governor office has been spent over the last 20 years. Could be. But none that the Biased Liberal media has reported. They are running a tight ship up there. It is bound to leak at some point.